Sometimes we can feel trapped by our circumstances. A job that pays a fixed income, bills to pay and choices to make, life can sometimes feel a little tough. We all have those moments, and you are certainly not alone. So how can you avoid this feeling of entrapment and start living your life to the fullest, the way we are supposed to? It starts by taking a long hard look at your current situation and making some positive changes to improve your circumstances. Check out some of the things you can do to stop feeling trapped by finances. When was the last time you really explored your current outgoings and worked out whether or not you could make some savings? The truth is, not many people pay much attention to what leaves their account. This could be a big mistake. Print off the last three months of bank statements and highlight anything you are unsure about. You may find you are still paying for things that you no longer need. Canceling those direct debits can give you the extra money you need to head straight into savings. Tip: Fast food adds up quick! Take notice of the things you are spending money on and see what you can eliminate. One of the biggest problems many people have is debt. It can take up a big chunk of their funds each month. Some people like to bury their head in the sand when it comes to debts, but often actually taking on the problem can be inspiring and help you to get out of the situation sooner. You could consider personal loans for debt consolidation to help you take control. It gives you one payment and one interest charge the saving can be great. But, if it isn’t an option, focus on the debt that costs you the most and get that one paid off sooner rather than later. Focusing on each debt individually can help you clear them for good. There are some bills that you can’t make changes to, but there are some spending habits that you can change. Your grocery shopping, for example, can be quite a big expenditure each week, but by making some changes to your habits like meal planning or changing where you shop can make such a big difference. Shop the sale items and stock up. Maybe you need to shop at two different grocery stores to get the best deals. When you are feeling trapped by finances, consider saving. Everyone can benefit from saving and savings challenges are a great way to do it. They are as simple as rounding off to the nearest whole number in your account and transferring the difference to your savings. It could include putting your change in a jar each night or you could do specific amounts each day or week. Your spare change can add up! Finally, why not put your spare time to good use and supplement your income in some way. It could be filling out online surveys or purging your closets and selling unwanted items online in Facebook groups or eBay. Are you crafty? Consider making DIY items and selling them. Maybe you need to pick up a part-time job temporarily to pay off debt quicker. 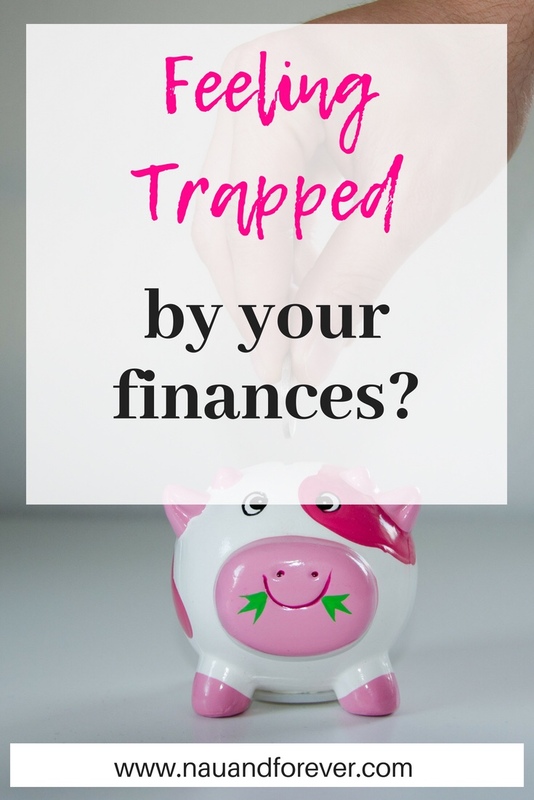 Feeling trapped by finances can be super scary. You may need to find some creative ways to get unstuck, but if you put your mind to it, you can accomplish it!